Modified bitumen flat roof repairs: The TRITOflex seamless liquid rubber membrane roofing system is ideal for restoring old modified bitumen (i.e. APP, SBS) roofs when they are leaking or deteriorated. You can avoid a costly and disruptive tear-off by applying a seamless rubber membrane over your existing roof. In many cases a rubber membrane will make your roof stronger than the day it was install. 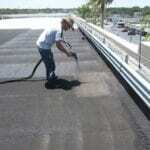 TRITOflex is lightweight at only 6 ounces per square foot and is quickly spray applied to the existing roof surface. The liquid rubber product forms a fully adhered rubber membrane over the existing modified system without the need for thousands of screws to hold it down like the most popular single-ply recover option. TRITOflex is able to be sprayed directly over the rough surface at any thickness in one coat. When completed with a TRITOtherm reflective top coat, it becomes a highly energy efficient roof as well. For commercial and industrial companies in need of a flat roof repair of any type we are now serving Windsor | Collingwood | London | Hamilton | Brampton | Sarnia | Guelph and Kitchener. Contact us for a FREE Roof evaluation.